SI.com’s newest writer and WVH fave Tobias Lopez wrote an interesting little piece yesterday on some comparisons between the old NASL and Major League Soccer. Normally I’m right on board with Lopez but on this not so much. For the most part Lopez is saying the league right now is following a little too closely in the footsteps of its predecessor. I get pieces like this from time to time from folks either through email or comments. Hey its understandable to think the league is moving a little too rapidly here after all those years of saying they had learned from the NASL’s mistakes. There are some arguments to the rapid expansion that I understand as well but looking at the facts the league is expanding right where it should be. 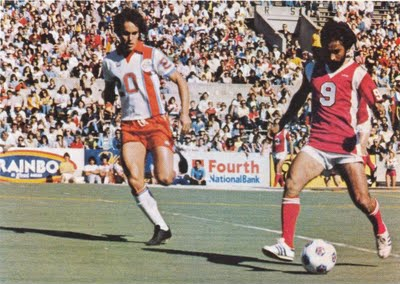 The NASL went from nine teams in 1973 to 20 teams in 1975 and peaked at 24 in 1980. During all of this expansion in MLS we’ve never seen more than two teams come into the league at once. Doubt we’ll ever see more than that. A lot of the worry however surrounds the Beckham rule or the Designated Player rule if you will. There is cause for worry and concern there that a club like New York can spend the money on three big name guys while other teams in the league fail to even spend the entire salary cap of $2.8 million. I know teams back in the day spent a lot of money on players they couldn’t afford but what club in the world didn’t do that back then? I’m fairly certainly a lot of clubs around the world had issues with spending money just like they do today. We shouldn’t think the NASL was the only league that wasted lots of money. I won’t even get into the attendance issues from this article. Its hard to compare what the New York clubs of today and back then are able to do at the gate (well this year speaking for the Red Bulls). A lot of clubs struggled at the gate back in the NASL days while attendance figures today aren’t as bad as we really make them out to be. Sure they could be better but the league is still fairly new when you really get down to things. Again I’m a fan of Lopez’s work but some of these comparisons just don’t work for me. I’m all for the slow growth that the league has done as much as the next guy but I do think its time to stop worrying back the old NASL issues. Maybe after another season or two the worries will go away as MLS will pass the old NASL in number of year in operation. With the new stadiums in Kansas City and Houston, MLS, like the some banks on Wall Street, is to big to fail now. The problem with the NASL was over expansion. I believe the MLS will settle for a 20 team league, in which a 300 million people nation can withstand and there no promise that the teams with multiple DPs will win the MLS cup, Columbus did it with one and Real Salt Lake had none.